The period from the middle of the nineteenth century to the early years of the twentieth saw a transformation in military firearms. British troops went to the Crimea in 1854 armed with rifles not very different from those of centuries earlier: muzzle loaders, in which the powder, shot and primer were separately loaded, limiting the rate of fire to only a few rounds per minute. Sixty years later they fought in the Great War with bolt-action rifles capable of thirty aimed rounds per minute (rpm). They also had automatic weapons - machine guns - which fired at around 600 rpm. While improvements in engineering and chemicals facilitated the change, these innovations were made possible by one technical development: the advent of the metal cartridge case holding the primer, powder and bullet together. The first cartridges emerged in the middle of the nineteenth century. Ammunition handling was immediately transformed and loading made much faster, even in the single-shot rifles of the day, as breech-loading became much easier to arrange. The rugged, convenient cartridges were particularly suited to mechanical handling and it was not long before the first machine guns were designed to use them. Developments in engineering permitted the mass production of cartridges and weapons to standard sizes which were interchangeable. Advances in chemicals led to the replacement of gunpowder, or black powder, by smokeless powders as the standard propellant. The new powders were not only relatively smokeless; their burning characteristics could more easily be adjusted to work efficiently in cartridges with a wide range of calibres and performance levels. This encouraged the development of smaller-calibre weapons, typically reducing the bullet diameter of military rifles from 11-12mm to around 7-8mm or, in some nations, 6.5mm. The new propellants also led to a great increase in muzzle velocities from around 400-500 metres per second (m/s) to 730-850 m/s, giving much greater effective range. Since the Great War, the development of infantry weapons has been gradual. There were few changes in small arms until the Second World War stimulated the development of greater individual firepower; at first with sub-machine guns, later with assault rifles. The first of these used pistol ammunition to produce a simple, short-range weapon. The second eventually replaced both high-powered rifles and sub-machine guns with a compact, shoulder-fired machine gun firing cartridges intermediate in power between pistol and rifle ammunition. 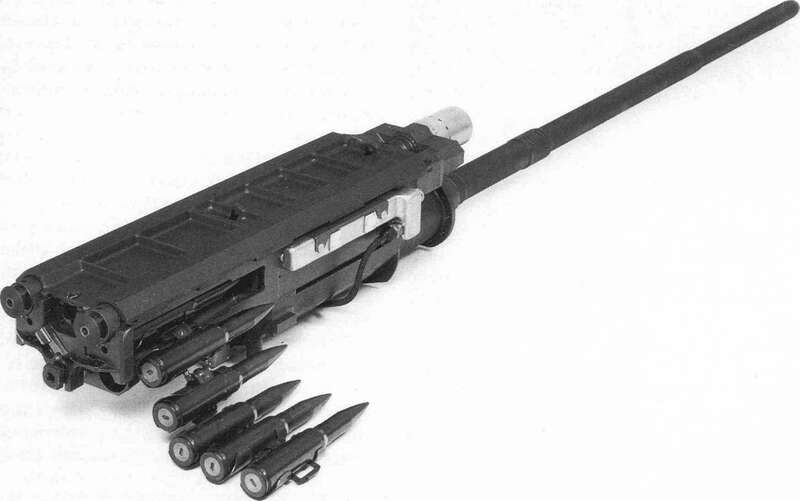 After that, little altered in weapon and ammunition design until well into the second half of the twentieth century, which has seen a further reduction in the calibre of the standard infantry weapon to around 5.5mm (5.56mm NATO, 5.45mm Russian) with an increase in muzzle velocities to about 900 m/s. Throughout this period the vast majority of machine guns have been designed to use the same cartridges as those of the standard infantry rifles (thereby referred to as rifle calibre machine guns, or RCMGs). This is partly because these cartridges have been, by definition, of adequate range and effectiveness to deal with enemy infantry, and partly to simplify ammunition production and supply. Only with the introduction of the 5.5mm rifles has there been a tendency to keep at least some infantry machine guns in the older 7.62mm calibre in the interests of adequate long-range performance. Various descriptions have evolved for machine guns of different types. The light machine gun (LMG), nowadays also sometimes called the squad automatic weapon or light support weapon, uses the same ammunition as the standard rifle and is light enough to be carried and fired by one man. Ammunition is usually contained in a detachable magazine to aid portability. The first such weapon to be successful were the Lewis and Madsen guns of the First World War. Two other famous examples which saw extensive service in the next war, and for some time thereafter, are the Browning automatic rifle (BAR) and the Bren gun. Todays LMGs are generally in 5.5mm calibre.